The following report posted below and the charts displayed are my synopsis and summary culled from a 26 page quarterly report provided by the people I work with at Marin Software, Inc. All contents of this blog post on ADM are the property of Marin Software, Inc. The fourth quarter has always proven to be the busiest for marketers — retailers in particular — because of the holiday season. On a quarter-over-quarter basis, advertisers faced increased competition resulting in higher costs per click. As predicted earlier this year, we saw mobile traffic peak at nearly 22% of all paid search clicks on Google in the US; we saw similar mobile traffic levels in the UK and Australia. We continue to see staggering growth around the adoption of smartphone and tablets for search advertising. As Marin’s customer base continues to expand globally, we have committed to expanding our analysis into new verticals and geographies to help provide more granular insights for marketers. In this quarterly report we included insights on paid search performance in Australia as well as industry-specific metrics for the Automotive, B2B, Finance, Retail and Travel verticals. To uncover key trends for the fourth quarter of 2012, we sampled the Marin Global Online Advertising Index, which includes global advertisers and agencies that invest over $4.0 billion annually in biddable media through the Marin platform. The Marin Global Online Advertising Index consists of enterprise-class marketers — larger advertisers and agencies that spend in excess of $1 Million annually on paid-search, display, social and mobile. As such, our data sample and findings skew towards the behavior of larger organizations and includes some of the world’s most sophisticated advertisers. This study is longitudinal, focusing on a representative set of advertisers who have been active on Marin for the previous five quarters and measuring key performance indicators (KPIs) on a year-over-year (YoY) and quarter-over-quarter (QoQ) basis. Unless otherwise mentioned, all of the analysis in this study refers to trends in the search (versus content) network. Wherever possible, we used medians and indexed values—instead of absolute values—to more clearly highlight overall trends. This allows us to mitigate the effects of outliers and make the findings more representative of the performance of the typical Marin client. For the Q4 2012 report, Marin refreshed our client index data pool. This could result in slight deviations from previously reported data but makes for more representative analysis and findings. saw a lower click through rate (CTR) year on year versus Q4 2011. 2. Google Maintains its Market Share for Search Spend: According to Comscore, 67.0% of all US-based search queries were conducted on Google during November 2012. During this same period, Yahoo! was at 12.1% and Microsoft at 16.2%. In light of having 67.0% of the overall US search volume, Google monetized its searches more effectively — accounting for 80% of paid search spend and 78% of all paid-clicks during the same period. On a year-over-year basis for Google, we saw significant increases in click and impression volumes. Quarter over quarter, the average CPC increased by 11% — indicating increased competition over the holiday season. On Yahoo and Bing, advertisers saw marked improvement in clicks. On a year-over-year basis, advertisers saw 25% higher click volumes along with a 22% jump in CPC and a 13% increase in the average CTR. 4. Device Targeting and Performance: While Desktops and Laptop computers still command the vast majority of search spend, we continue to see positive trends as marketers explore new platforms to extend their reach. Device targeting, in particular, is showing that smartphones and tablets are becoming increasingly popular around the world. To provide context around usage patterns and spend allocation, the charts below show how click and spend share was segmented across our client base during the fourth quarter of 2012. Smartphone and tablet devices accounted for a 22% share of clicks and 17% share of spend. Growth in consumer adoption has been a strong driver of click volume growth on mobile devices. Additionally, spend allocations on mobile devices are growing quickly as marketers realize solid performance across both smartphones and tablets. The following charts compare CTR and CPC across desktops, smartphones, and tablets for the fourth quarter of 2012. While device targeting may not be relevant for all advertisers, marketers should evaluate their target demographic and, where appropriate, leverage the performance and cost effectiveness of targeting ads to tablet or smartphone users. Across geographies, the CTR from Facebook campaigns is comparable. In regards to cost, advertisers in Australia experience a higher average CPC than their counterparts in the rest of the world. Compared to the average CPC of paid search advertising, Facebook is seemingly a less expensive alternative, offering creative advertising options outside of the traditional search and display. Additionally, with the release of mobile-specific targeting for Facebook ads, advertisers are starting to see a higher CTR for mobile ads versus desktop ads. We’ll continue to monitor this trend as more advertisers adopt the mobile-placement option on Facebook. Among many reasons I wanted to feature Pamela Vaughan’s article on the ADM Professional Community is my own direct experience working on teams that provide marketing services and advertising products to auto dealers. While working on such teams for many years (since 1997), I was privileged to collaborate with some of the brightest minds in automotive marketing. 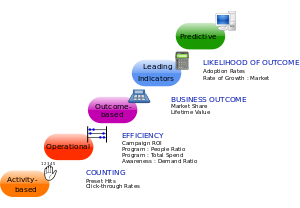 A standard operating procedure for such supplier and service provider based teams is to focus on researching a never ending supply of Key Performance Indicator (KPI) data and Reporting Analytics… Many hours and a high level of concentration are routinely invested in extracting the data points that make the products these teams provide to car dealers appear more effective than they may actually be for most dealerships. The logic behind these initiatives is similar to the old days of the Cold War with “Mutual Assured Destruction” (MAD)… Since each supplier’s perception is that their competition is doing it, they feel a tremendous amount of pressure to extract the compelling data that will empower their sales team in gaining a competitive advantage while seeking each dealer’s attention. Although the data is usually factually true, I have seen far too many dealers exhibit a tendency to become overly dependent on supplier provided reports and metrics. This is then exacerbated by the far too prevalent tendency to focus on examples and “Case Studies” taken from other dealers which have been selected for the purpose of making a sales presentation or proposal. Like most automotive professional marketers, I am a firm believer in the appropriate use of Key Performance Indicator (KPI) tracking and reporting. However, it serves every dealer well to realize that the most important metrics are the ones the dealer extracts themselves, or by trusted managers using the same measurement tools and parameters each month. The most relevant Key Performance Metrics (KPI) are the ones generated by the dealership when compared to the previous month, the same month a year ago, the YTD compared to the same time period a year ago. These are extracted and reviewed without filtering or withholding of data points that do not show what somebody wants to see reviewed by the dealer. As stated, my personal experience is that Marketing Reports and Performance Metrics that are reported to dealers by suppliers and service providers are completely factual, but they have been selected by design, and for the purpose of casting a favorable light on the products or services that supplier offers. There is a growing trend for many of the more all inclusive dealer website and marketing service suppliers to create proprietary and inclusive reporting systems. These supplier provided reporting tools and apps remind me of asking a fox to report on the state of the hen house. I have seen several of them make use of such tactics as (for example) blending organic traffic with paid traffic, then dividing by the dollars the dealer spends within THAT SUPPLIER’S Search Engine Advertising (SEA or SEM) system. The assumption being that all traffic to the dealer’s website came from their own source of search advertising, which results in reports that appear to be a very low “Cost Per Visitor”… The dealer that views such reports will routinely confuse this metric with Google generated “Cost Per Click” data, incorrectly concluding that the supplier’s system is performing far better than it actually is. Such systems also take advantage of OEM sponsored or third party provided Search Engine Advertising (SEA) programs to enhance what their internal and proprietary reports show the dealer. These types of supplier built data and KPI reports are being generated from “Bias Engineered In” reporting systems. This creates a compelling argument in favor of using independent and more reliable KPI reporting and tracking applications, such as Google Analytics. Reporting application such as Google Analytics, WebTrends or Adobe’s SiteCatalyst are a far better source of data for making marketing decisions. They are unbiased and more reliable for dealers to use. Almost all supplier engineered, designed and built-in reporting system will BY DESIGN contain a bias towards making value added products and services sold by that same supplier look better.